Back in December, I was admiring 30 ducklings at a friend’s place and was quite taken by their fluff and squeak, so I took 4 of them home. Ducks were not in our short, or medium term, plan – but it’s funny how quickly you can justify something, ‘just because’. I was told they were khaki campbells, however they turned out to be ‘bitzas’, as in a bit of this and a bit of that. Unfortunately (for them) they ended up being mostly boys so two were eaten, then one was taken by the local grey goshawk and the last one (who we thought was a girl) turned out to be a boy. But we kept him, named him Song and got him a mate called Bruny, named so as she’s brown and ‘browny’ was a tad too obvious as a name. She’s a beautiful pure bred khaki campbell from down the road. We’re hoping they have babies so we can eventually just have two girls for eggs and company. Khaki campbells were our desired breed as they’re known to be homebodies (so don’t try and escape), are prolific egg layers (yum) and most importantly, don’t trash the vegie garden so can free range permanently – snuffling for bugs and slugs and depositing their poo across the garden. Khakis were originally bred in England and are a combination of mallards, rouens and runner ducks. They generally come in three colour varieties – khaki, dark and white. The drake (the boy) is usually mostly khaki colored with a darker olive green head lacking the white ring of its Mallard ancestors. The duck (the girl) has the usual underwhelming colour scheme and is khaki (brown) all over. I think our drake must be more mallard than anything else as he has the white ring around his neck. One of the key reasons we wanted khaki campbells was because we were told they were very gentle, wouldn’t destroy the garden, are great with kids and are pretty chilled out. While ours are all of these things, they REALLY don’t like people. This is because they weren’t hand raised, instead they roamed free in their exclusive duck gang. The fist time they encountered a human closely was when they were around 4 weeks old and I picked them up and took them home. In complete contrast, if you hand raise them they’ll ‘imprint’ themselves onto you and in some cases think that you’re their mother/father or mate and want leave your side. The egg production of the khakis is awesome with the breed laying an average of 320 eggs a year, so having a couple of ducks laying over winter (when the chickens stop) is a wonderful thing and something we’re aiming for. Apparently they’re not the most desired meat bird as they’re not as ‘fat’ as others, but Anton swears they’re pretty tasty. Fertigation is where irrigation meets fertilisation – think poo in water all mixed up. 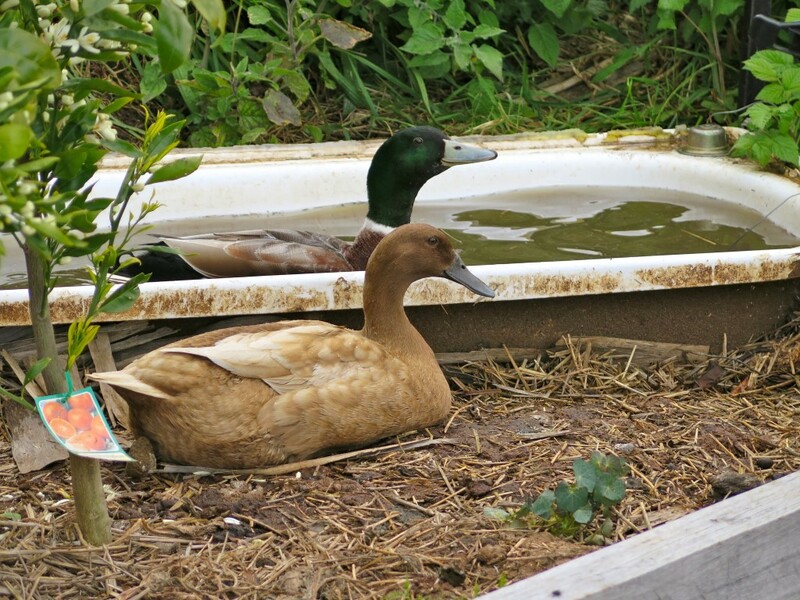 As ducks need water to be happy, we gave them a pond, i.e. an old bath in the ground. Being ducks they LOVE to poo in the water so it quickly turns dark brown and will stink if you don’t empty it regularly. We empty ours weekly and have it placed high on our slope so we can use gravity to direct the flow onto our young edible forest garden and other perennial crops. As it’s a strong mix of poo and water I wouldn’t go splashing it on your lettuce leaves, unless you remember to wash them thoroughly. Theoretically, no. However Song (the drake) likes to take daily flights across the valley, just like a ‘proper bird’. We were shocked at first, but he comes back every time as I think he’s got the hots for Bruny big time. In contrast, Bruny doesn’t budge, I assume this is because she’s a pure bred khaki campbell so lives up to her breed description. If you want baby ducklings then you may have a problem. While they lay heaps of eggs (usually 1 a day), they don’t actually like to sit on them. Generally, mechanical incubators or broody chickens are used to hatch eggs instead, this takes around 23 to 28 days. 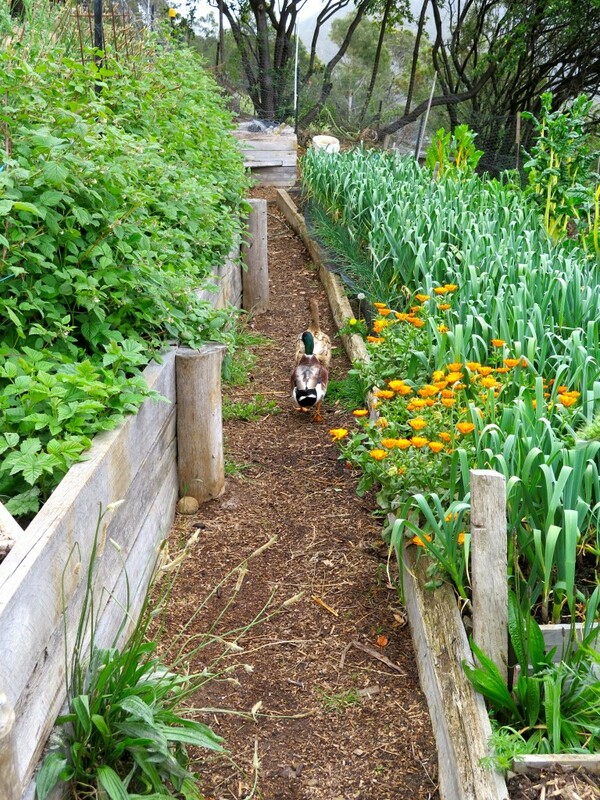 Our ducks free range around our vegie garden and young orchard which we love. However, we’ve had to protect our young seeds/seedlings from them (and the garlic patch) as the ducks just want to snuffle right at the base of the plants or areas we’ve just cultivated, presumably because there’s increased bug/slug activity. Happily, a really short fence (around 40cm and only 10cm for the garlic) which we can still easily step over (or individual seedling protection) has stopped this. 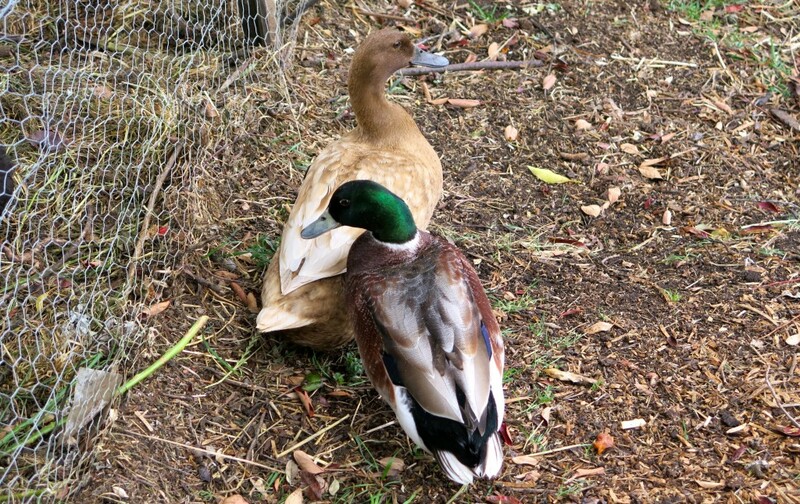 Overall, compared to other breeds (I’m told the muscovy duck is ruthless and leaves no survivors in the vegie patch), the khaki campbell is an angel and we’re stoked we can pretty much let them roam free and express their “duckness”. We love our ducks and often find ourselves pausing and watching them waddle around, snuffling and quaking. Slowly, ever so slowly, they’re learning to like us, or at least tolerate us, which is exciting. They’re a fantastic multi-purposed animal to have in your food system with numerous benefits and a huge amount of character to keep you smiling. So yup, we’re on team khaki campbell! Hi, We lived self sufficiently for many years and kept Khaki Campbell ducks and totally agree that they are wonderful additions to the gardens both in fertilisation and slug patrol. One thing though, we did not have trouble getting ours to sit on eggs and they produced many ducklings, up to 12 at a time. My theory is that it is a genetic memory thing. Ours were not incubated so were naturally bred and then went onto being good mothers. Over 20 odd years and much observation of poultry of all descriptions, I believe it is the incubation process that is breaking down the ability for poultry to raise their young. Our experience of incubated birds is that within three generations, they have lost the ability to mother and the only way we got around that was to sit those breeds under other mothers who had not lost their ability i.e., kharki ducks under muscovy mums until they genetically relearned this skill. Just a thought to add to your mix. Thanks for the great articles. That is SO interesting, I reckon I’ll do some more reading, research and thinking into this as it’d be great to reactivate that natural memory. Funnily enough the two we have were ‘naturally’ raised by their respective mums, so no incubator – but I’ll look into it more. Do your khakis make good mom’s? We have a 2year old laying on about 14 eggs. She hasn’t moved in a week and we candled the eggs and have ducklings. We just weren’t sure if we would need to move them into the garage once they hatch or if the house and run we have will be sufficient. Sure do! Leave your eggs with them for sure. The only trouble we had was with predator birds (crows) eating the baby ducklings so be sure to have a caged/protected space for them for at least their first month of life. Lovely to see your garden and hear about your ducks. You’ve almost sold me on them, despite bad experiences with rather stroppy geese as a kid. Thanks hannah. 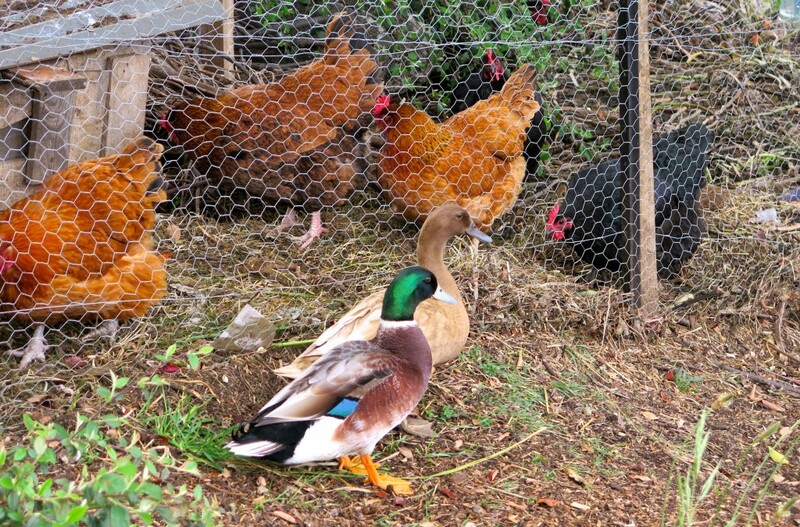 Thinking of replacing the source chooks with ducks, to keep grass down in the orchard. Do u reckon they’ll be good grass munchers? The chooks aren’t cutting it. And whipper snipper vollies r hard to find. What do they like to sleep in? I reckon for grass cutters guinea pigs or rabbits are best (in a tractor system) as they reliably eat grass like there’s no tomorrow. Compared to ducks and chooks who are more interested in what’s in/under/around grass – our ducks nuzzle grass rather than actually eat much of it. And while our chooks will scratch it up and eat it, doesn’t mean all chooks will. Some chooks (aracanas, most bantams etc) aren’t great at getting rid of grass as they’re not as vigorous – it’s all about the breed! Thanks Hannah. Good to know : ) I was thinking guinea pigs, but Andrew reckons the chooks dominate the gps too much and boss them around, and he feels sad for them. Hmmmm. ducks sound good. 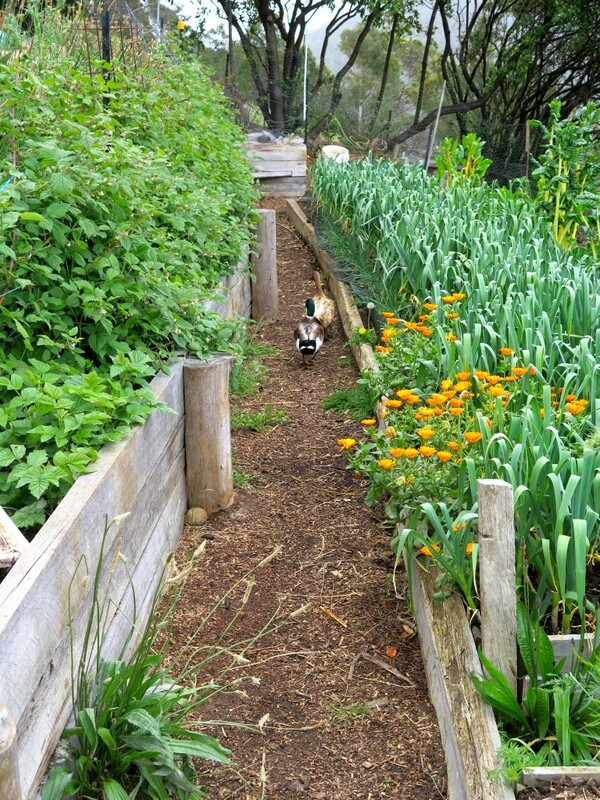 Though I just LOVED the shot of their veggie garden. hi, i am getting some khaki campbells soon. i have been making a cage on the bank of the dam for them to live in.my question is, will they walk up a boardwalk into the pen. the actual pen is about 2 1/2 foot off the ground for ventilation.??? and will they lay off the ground.?? thank you. That looks like a Welsh Harlequin drake. It’s what we call a ‘bitzer’ – a bit of this and a bit of that. It’s got a good bit of mallard duck in him. Does anyone know where I could buy some Khaki campbell ducklings (a drake and three ducks would be good)? I’m in Central Victoria. Sounds like Cocoa is a character Aimee :-)! We’ve only every known comparatively relaxed khaki campbells, but they’re all individuals aren’t they! how high do they fly that I have to build a fence to keep them inside my property? If they’re pure bred khaki campbell ducks, only around 1m high. IF they’re a mixed breed (i.e. with mallads) they’ll often end up flying like a “normal” bird and no fence will keep them in. where can I get khaki campbell ducks that could lay 300 or more eggs per year, around the Melbourne area? I prefer them to be pure khaki campbell, and a flock of 2 boys and 8 girls will be a good start.